This A4 poster was spotted recently in a local church hall. I have no idea when it was produced, or where. But it is quite clever. Does anybody know if actual 'stamps' were produced? They would be cinderellas, of course, but they would be quite collectable! Was this perhaps produced in Neasden? 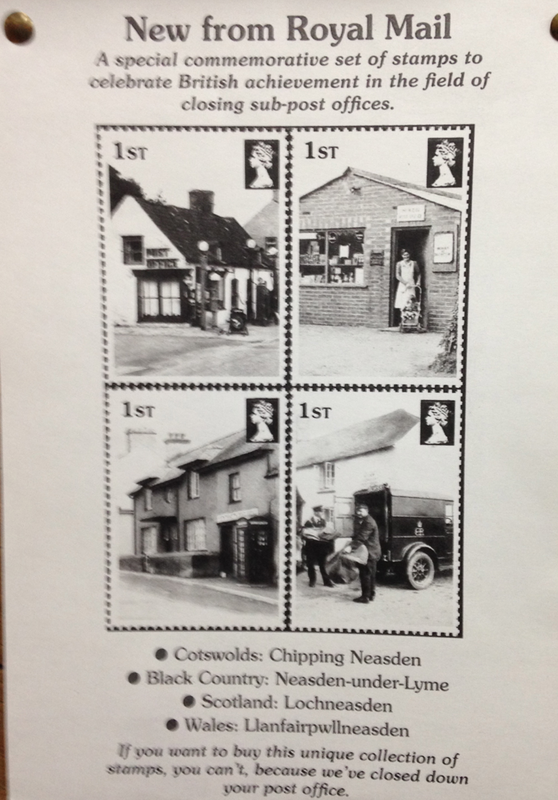 If no stamps have been produced, I'm sure some will be now! Is anyone able to identify the last one? Neasden under Lyme in the Black Country? Not the Black Country I grew up in! They should stamp out this sort of thing! And the missing one from my list (bottom left) is Pentraeth, Anglesey. Another new 2015 Machin definitive appears. London 2015 Europhilex Post and Go report. Penny Black Day - BPMA and other news. More new slogan postmarks - and website update.